WordPress 4.5 RC 1 – still the latest. RC 2 this week? Why hello there everybody this is Adam Silver, the host of the Kitchen Sink WP Podcast. Thanks for being here, let's get started. All right, first and foremost upcoming events. Next weekend April 8th through the 10th is WordCamp London. I wish I could be there, that would be amazing to be in London in general and then go to a WordCamp there, that would be awesome. Hey, by the way my good friend Carrie Lee Maruki will be there, she's a photographer she has a big huge fundraiser, Kickstarter project she is trying to be the historian of WordPress and WordCamps. From a photographers standpoint she's awesome. Just spent a couple days with her here in Los Angeles as I hired her to shoot my son's bar mitzvah and she did amazing work, even in the rehearsal stuff. So reach out and say hi you want to get a quick shot for yourself, I'm sure she'll take a picture of you in general but she's awesome so say hi to Carrie Lee when you see her in London, she will be there. I will see her down in WordCamp in San Diego in a couple more weeks, she's travelling the world so check her out and say hi. All right, what else? Upcoming events, Woo Conference WooConf is this week. Tickets I think are still available, $600 let me double check that for you right now. Let's double check that. Are they still available? I believe so. Yes $699 actually, so you can still get a ticket for $700. What's cool is if you can't make it to Arizona, no it's in actually in Texas my bad, you can get the live streaming ticket for $49. I actually might do that so we'll check that out. I wish I could go. So if you're in to WooCommerce or check out the WooConf. It's $49 for a live-stream ticket, totally worth it I believe and I think I'm going to go ahead and jump in on that. I just want to know if they're going to record them and make them available if I can't watch it live. I got to make sure on that. Anyway, what else? So that's it on upcoming events. Segment 1 moving along here in the news. Not a lot going on in the news from my perspective. This last week I was kind of busy but WordPress [Work.5 00:02:35] is still in release candidate 1 no RC2 just yet, but I am confident that this week we will see another one come out. I just have a feeling that we'll see an RC2 probably in the next 24 hours because I'm recording now and of course they will release it right after I finish recording, editing, and publishing this. So look for RC2 coming out in the next week. And we are on track, if I'm not mistaken, for release a week from next week so the 12th I believe, like I said two weeks ago. That is it for the news this week. On to segment 2 but first I do want to thank this week's sponsor. Once again it's Harvester Solutions, like I said last week I am asked often for help in social media and just kind of helping people do Twitter, Facebook, and what not for them. I enjoy it, I do it in my day job but sometimes I run in to time, like I said, if you want a deeper dive like let's say a full digital audit or some social media foundation plan, which I've done, but if you really want some focused attention to it, give Harvester Solution a call or email. That's what they do, it's Stephen Harvey runs that shop over there. He's great at it, he loves it, he lives and breathes social media. So if you're looking for some extra help check out Harvester Solutions. Thanks again to them for sponsoring this episode of Kitchen Sink WP. On to Segment 2 this week is collaborate and listen. It's all about collaboration. This weeks topic came to me when I was out for a morning run last week. I had set my playlist to a random music for the final 2 laps, left the podcasting. Needed some music and old school Vanilla Ice came up. Some of you may not know who that is I'm just that old if you will and I didn't even know I had that on my playlist. I didn't know it was even on my iPhone, that was kind of weird. So anyway, collaborate and listen. This week I'm thinking about how can we collaborate on projects. With WordPress and multiple people could use certain things in project or projects plural. So I'm thinking about that, I figured there are a few ways to look at this. One being external tools and one being internal tools. Internal I mean a plugin or something that you would use inside your WordPress install. Externally I am talking about an outside service or a piece of software that's not directly connected to your WordPress but it could be tied in in a round about way, and we'll get to that. Starting with internal, I headed over to the plugin repository I typed in the word collaboration and 185 results came up and not everything kind of matched it just had the word collaboration in the plugin description. So I went through a good few, 5, 7, 10 pages, I didn't look at every one of them, all 185. But I came up with, I read the descriptions, reviews, and I also checked out the same kind of verbiage in Google. 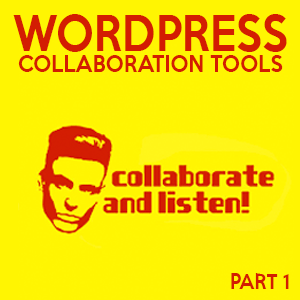 I typed in WordPress collaboration and it came back with a handful of similar results of what stands out. And what came out were these probably 4 or 5 plugins and I took sometime with about 3 of them. I'll tell you about them right now, in no specific order. For example, there is WP Project Manager and this is pretty cool. Both free and paid are available, you can add projects, collaborate with a team, on per level user, you can assign a creator and project visibility, track milestones, and these are all things that are important. You could in this case, set this up not to just collaborate with your team but you could set this up to collaborate with a client, which is interesting. How much information does a client need to see, or do you want them to see where things are at? Like I said, a free version and a paid version, the paid version starts at $59 with a lot more features and it might be worth it. Because I tried it, I tried the free version and I liked it and it looks pretty cool but some of the features I wanted required the pro-version from right away. And for $59 I would probably go that route, I would want the paid pro-version to have the extra features: the calendaring, some other things that were there. Totally worth it, for sixty bucks. That was for I believe one site, let me double check that for you right here. Pricing, let me go here, pro-version, yes so calendar, tasks, permissions, privacy, 4 or 5, 4 of the things that were on the pro version only. There were more as well, let me go back here. Let's double check on pricing, yeah so single site $59, 5 sites $100 so I would actually do that, well I don't know if I'm just collaborating on one site yeah that's an interesting question. $60 for your own site your doing Project Manager with but if you're doing client work for freelance developers you'll want to go to $100 for sure. If you're an agency $200 so it's unlimited, okay, so that makes sense. There you go $14 money back guarantee I'm not connected to any of these companies by the way I'm just kind of looking at what's out there for us as developers or as project managers ourselves. What else? The next one was this, that was WP Project Manager, links to all these will be in the show notes. Task Freak was another one, I like the name of it, I thought that's kind of a cool name. And I like tasks, I'm a big to-do guy. This was also relatively easy to install, everything's a one click install. You have integration of WordPress, users and roles, you can create public and private projects which I thought was really neat. You can add attachments and comments on your tasks which I also thought that was cool. It's mobile device friendly, what else? Oh yeah and the users are associated to projects by roles. Standard set of tools, like the WP Project Manager, like the one I just mentioned. Though it hasn't been updated in about ten months, and that concerns me. Ten months like why haven't they updated? So you know I'm leery on starting to work with something like that, with an aged, a lack of an update based on the age because what if you get involved and they have stopped developing it. Right off the bat I'm thinking it may not be my favorite. I like the name, I like some of the features. The UI was a bit older but overall has a similar feature set. Third, Panorama very robust. Free and paid, paid starting at $69. The free level has time elapsed per project, project tracking, some milestones, discussions, project phases, and a start and end calendar. What I found interesting, it is a really nice interface, very clean. The UI was awesome. It does want ACF, which stands for Advanced Custom Fields, it's another plugin. I guess it installs it but it says you should do your own install and I've had it on my cue to do a review of ACF in general. What ACF is? How it's awesome and people love it. I know enough about it, but I want to know more, I want to do a more deeper dive into it. That'll be down in a few months from now, I'm hoping a few weeks, at least a few weeks maybe months anyway. I really did like Panorama it was very robust. I like the interface. All of these use short codes so you can create a page called projects if you want, if you want it to be public viewing and use a short code and that's where the data will show up. I believe it was Panorama that actually had no front end, it was all dashboard based which is kind of cool as well. I'll use custom post types. With all this in mind, these are all internal tools. Once you say collaboration, the key word there becomes project management. It opens the door to mean a lot of different things to different people. Keep in mind that it depends on what one needs for the project in question, and who is using it. My intent here is solely that you can use, and create projects, assign tasks, track how things are going, and collaborate then with your team or your client. So you really have to try a few things out. These are all internal, these are all plugins in a WordPress installation. Obviously there are external tools as well and with keeping the show on track as far as time goes I'm going to talk about external tools to collaborate with on next weeks show. That'll be part two will be next week. With that said, moving on to segment three tip and tool of the week. This week the tip and tool is decomments.com. De:comments actually it's a plugin, it's over at decomments.com. It allows you to comment on your blog or website, obviously you can use that already if you don't like the built in commenting system. I didn't a long time ago, it's gotten a lot more robust and stronger. The spam filter with akismet is great now and I recommend it for a lot of people, but because of how my sites are set up I used Disqus a long time ago. Disqus is spelt D-I-S-Q-U-S and I know a lot of people don't like Disqus for multiple reasons. I have no problem with it, it does tax my site a little bit on speed I've done some testing there. I'm curious to know, what this De:comments will do on speed. The only issue here is it's a paid plugin, it's premium, and I don't find that as a huge problem. It's $50 for one site, not a terrible, it's not a deal breaker if you will because I'm all about investing in tools that work for you. I wish the demo was available, I could download it and install it, and see how it effects my site's speed and my load speed. I really do. What's cool about it. It's a quick install, two clicks apparently. It has a lot of built in features, multi-lingual, it has the ability to add animated gifts, pictures, etc. You can vote up, and vote down, post and what not for a commenting system. It's kind of nice, it's not bad it looks great. But I didn't like the idea, the fact I couldn't install it locally, even with a limited feature set to see how it would affect my speed. So fifty bucks, give it a try, it can't hurt and it's over at decomments.com. D-E-C-O-M-M-E-N-T-S.com Again I have no affiliation with them what-so-ever, just want to give you guys a tip or tool of the week. If you are not interested anymore in Livefyre, or disqus, or the built-in commenting system of the WordPress core. Check them out. Anyway that is it for this week, next week like I said will be Part 2 of Collaboration tools. If you have any questions between now and then go ahead and send it in via email at Adam@kitchensinkwp.com almost don't know my email. Or use the SpeedPipe functionality on the website. Thanks for listening see you next week. Have a great week, go out and do some awesome things in WordPress. Talk to you later, bye bye.